I have always loved writing stories and making connections. When I was about six or seven, I used to nag people to give me a set of random words and then enjoyed weaving them all together in one story. 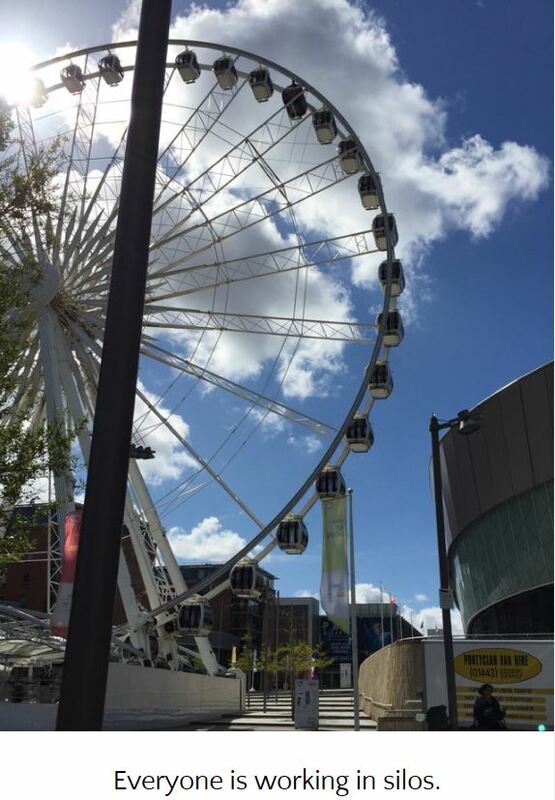 I had forgotten all about this until Mum reminded me when I saw her at the weekend and was telling her about my talk at the NHS Confederation Annual Conference (#Confed2015) last week in Liverpool and some thoughts I have about taking it forward. Once again it is all about bringing different people and threads together and making a coherent whole. 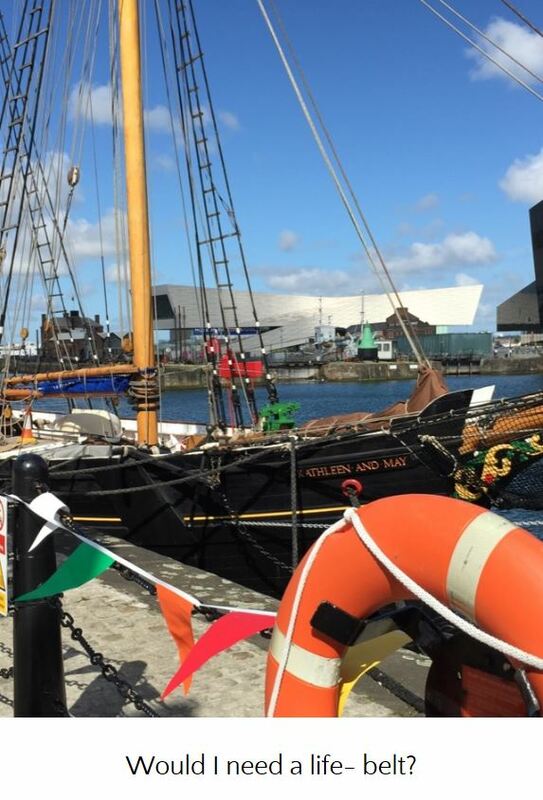 I had a great time at the conference and in Liverpool generally. 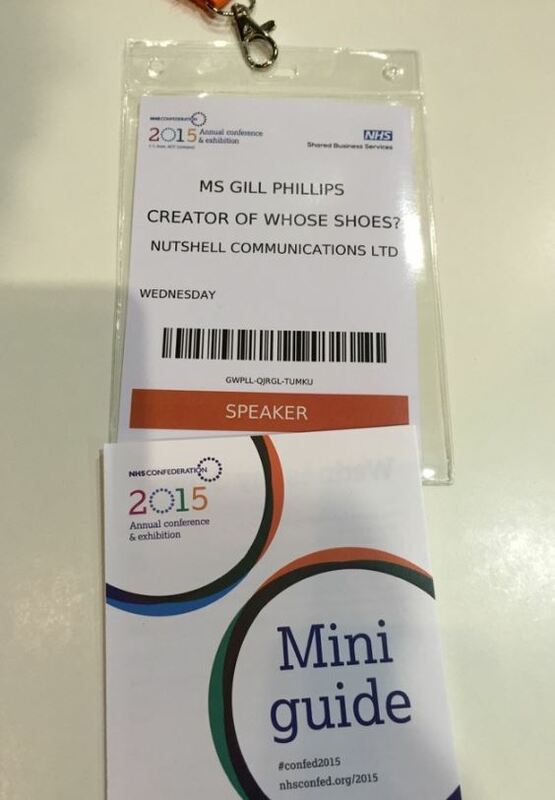 I put together a visual story on Steller which has been fun: Gill’s alternative take on #Confed2015. I was pleased to be invited as I had enjoyed taking part on the Guardian panel recently on a related topic, the highlights of which were published yesterday. Mark talked about the challenges, including sharing this great new animation film which explains the situation well. Next up was Sharn Elton, Director of Operations NHS East and North Hertfordshire Clinical Commissioning Group, sharing good practice as one of the ‘Five Year, Forward Vision’ Vanguard sites. It was good to hear how services can be more integrated with a bit of multi-disciplinary imagination. Then it was over to me to give a Whose Shoes? multi perspective type take on things. To be honest, it was not the easiest audience. Many of them looked happy tapping into their laptops about systems and processes but singularly uncomfortable to be confronted by The Idea That There Are Real People Involved (a.k.a. patients). 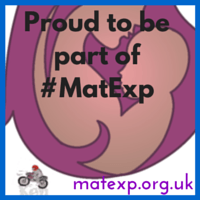 People who have lives to lead and who might not want to be seen as ‘just’ a medical condition or a set of services. I started with a poem to test the water. I was buoyed (excuse the pun) by the lovely messages I had received from my Twitter pals who ‘get’ what I am trying to achieve. 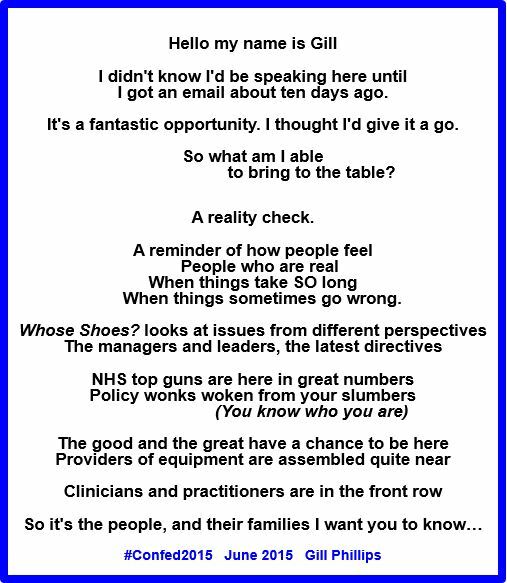 @WhoseShoes @Care_Charts_UK @piponthecommons @NHSConfed_RobW good luck Gill, though with images like this & @Gills_Mum, you don't need luck! Anyway, I’ll tell you a bit more about the actual session at the end but I think the connections and possibilities that are growing from it are exciting. Dr Mark Newbold is chairing this commission and seems to like my Whose Shoes? way of linking people and bringing real (often very challenging) voices into policy development. My mum is 93, fiercely independent but with mobility problems and now living in Assisted Living accommodation, where she has friends with a similar range of medical conditions but who want to enjoy life and stay out of hospital ! They will be keen to have their say! Mum writes her own blog, including this powerful ‘Sunk without trace’ blog she wrote especially for this conference and which has had loads of ‘hits’ and some nice comments. Mum has ‘no idea’ why her writing strikes such a chord with so many people. 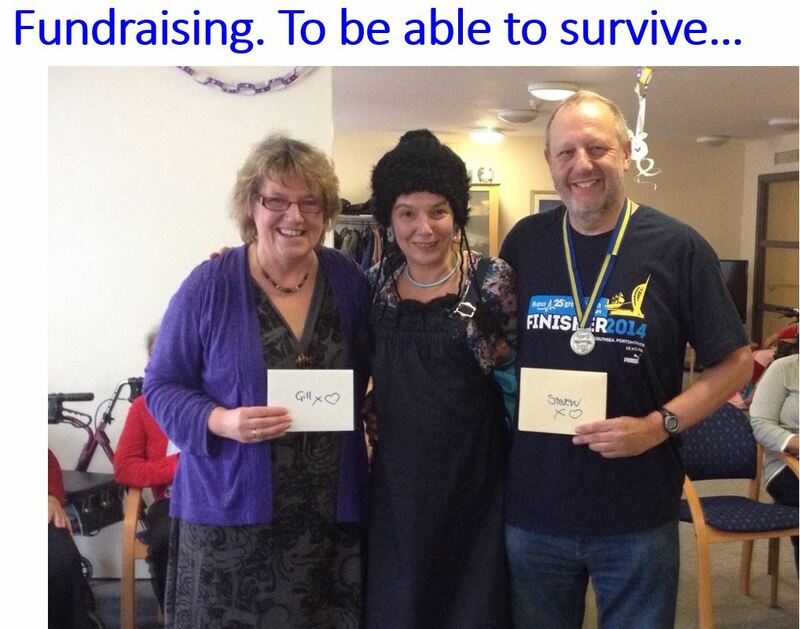 I am part of a very strong network of people who are either ‘patients’, carers, or ex-carers, many caring for elderly parents, often living with dementia. These are special people who have not only dealt with their personal challenges but done something about it; now recognised as national speakers and innovators. @Care_Charts_UK @WhoseShoes Very interesting. "Cold, damp and dangerous homes cost the NHS £2.5bn a year" Yes, #joinedup #thinking needed. Coincidentally, when I first developed the electronic version of Whose Shoes?, I did it in collaboration with older people including residents of Extra Care Charitable Trust. 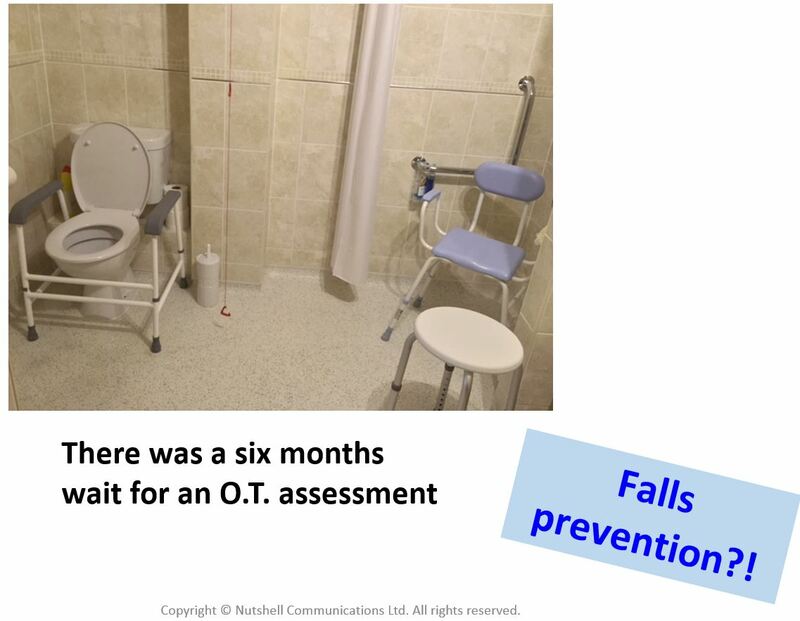 It was part of an SBRI competition around nutrition and mobility, which is central to keeping people out of hospital! I therefore have Whose Shoes? scenarios, co-produced with older people, to start conversations around these topics. I am hoping that, as a group of critical friends, including some life-hungry 90 year olds, we can help Mark and the rest of the Commission make progress. 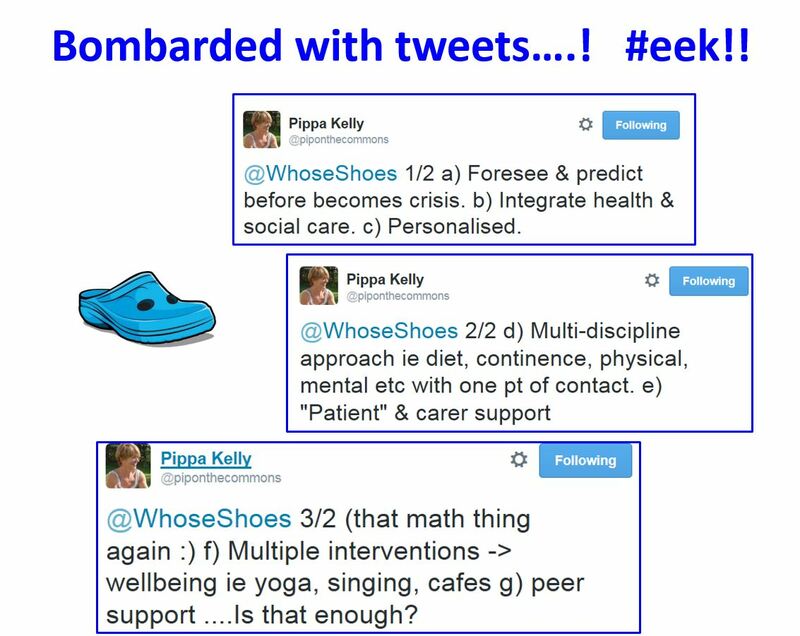 @WhoseShoes @NHSConfed_RobW @nhsconfed Your talk was inspiring we will definitely take up your offer of a group 'critical friend' session! This gives you a flavour. A ‘wee taste’ as my Mum would say. I had crowd-sourced and talked about the things that people thought were important. I brought in some personal stories – simple things to make people think. When Mum moved into Assisted Living last year, a friend of mine who is an O.T. did an assessment and we bought all the equipment and arranged the support Mum needed. The wait for a social care assessment was six months. If we had waited six months, I would guarantee that Mum would have had a fall and ended up in A&E. The assessment took about 45 minutes. Where is the joined-up thinking? I talked about my Dad who had, in total, eight heart attacks and little things that really helped him (and us, as a family). I talked about the need for people to stop working in silos. 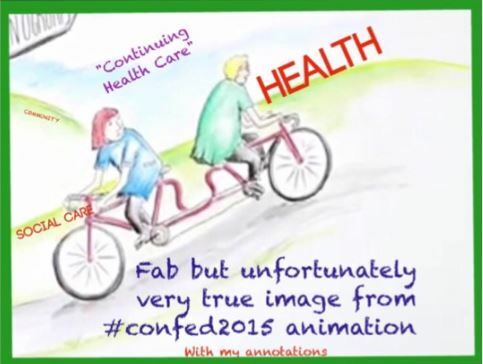 I talked about one of my personal bug-bears “Continuing (NOT) Health Care“. A bit like a red rag to a bull really. I graffiti-ed up an image from the animated film. And I talked, of course, about the Healthy Living Club in Lambeth. Regular readers will know how much I love them – they cut through all the ‘stuff’ and just have fun WITH people living with dementia. I pointed out that this is ‘community’ at its best – if someone is missing one week, people will enquire and make sure they are OK.
Having fun prevents social isolation; the exercises keep people mobile; the music enables them to join in and smile. And yet they never have any MONEY!! My friend from Bristol University days – Steve Cordery – who has kindly been helping raise money for the Healthy Living Club. I behaved myself and refrained from asking how much it was costing for some of the apparent ‘non-swimmers’ to attend the conference. But I did suggest that commissioners might be a bit more imaginative in terms of seeking out highly cost-effective, imaginative ‘interventions’ and ‘therapies’ to support (well you have to talk the right language!). 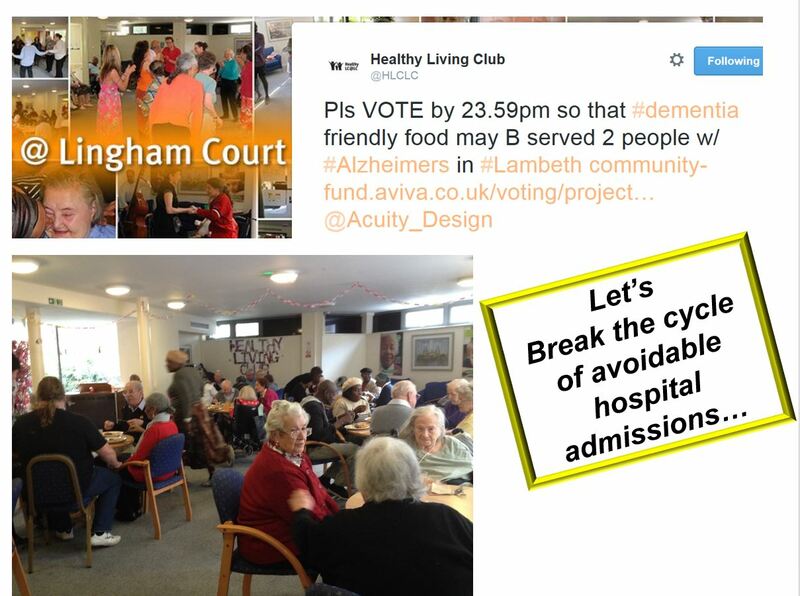 And I showed a photo of the club members having a nutritious ‘dementia-friendly’ meal – and pointed out that the club had no money to keep the meals going either. “We need to get over ourselves”. Well said, Andrea Sutcliffe. In typical down-to-earth fashion, @Crouchendtiger7 says of different sectors of health & social care, "We need to get over ourselves". Yes. Now we need the action. Lovely photo sent by George Coxon in response to my crowd-sourcing research. This entry was posted in co-production, community engagement, dementia, end of life, health, housing, in my shoes, personalisation, safeguarding, well-being and tagged Alzheimer Disease, carers, change, community, Compassion, Conditions and Diseases, creativity, dementia, dignity, elderly, health, independence, integration, older people, Quality of life, social care, wellbeing, Whose Shoes?. Bookmark the permalink. I really like the digital thread weaving it’s way through this, and how it complements the people side of the story; from research to preparation to presenting to sharing. Gill this is so wonderful. I haven’t had a chance to watch your video yet..it’s queued up to watch today. I like to crowdsource ideas when I am preparing for a talk too. Isn’t it a great way of drawing in more “real” people into your talk! I must check out steller – I hadn’t heard of it until now, and I love to try out new ideas for my own talks. (By the way the link to your steller account isn’t working and I am dying to see it) I am interested in your observation that the audience appeared uncomfortable to be confronted by real-life depiction. In a way that’s a good thing – it means they need to hear your message!